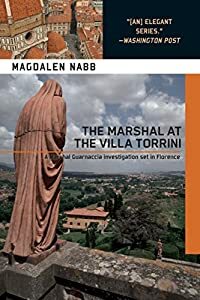 The Marshal at the Villa Torrini by Magdalen Nabb, a Mysterious Review. Review: A Marshal's work is never done, as the Marshal tries to close one case while opening another in The Marshal at the Villa Torrini, the 9th mystery in this series by the late Magdalen Nabb. Originally published in 1994, Soho Press is reissuing the early books in this outstanding series of mysteries that take place in Florence, Italy. Salvatore Guarnaccia, Marshal-in-Chief of the Carabinieri, in command of the Pitti Palace Police Station, has been called as a Prosecution witness in the trial of the death of Anna Maria Grazzini, aged thirty-five and in "robust health", who died, according to the three witnesses, after receiving "a bit of a push" causing her to fall near a chest of drawers. When she arrived at the Santa Maria Nuovo Hospital she was found to have injuries of a fractured jaw and cranium, five broken ribs and a punctured pancreas. While waiting to testify, the Marshal is called to the villa of Eugenia Torrini who believes there is something just not right in her neighbor's apartment. The light is always on in the bathroom but no one answers the telephone or the door. When the Marshal goes to check, he finds the doors locked. Torrini has a key and together they enter the apartment. There they find Celia Rose Carter dead in her bathtub filled with red water and pinkish foam, a wine glass broken under her body. Her husband is in a drunken state of unconsciousness in the next room. In a little town where not much more is expected of the Marshal than to keep order in the district, settle neighbor disputes, find stolen bicycles and snatched purses, this is certainly a situation of intrigue. Celia Carter was a writer. She was well known and well liked, and was also well paid for her work. She had a teenaged daughter away at college in London. She fell in love with and married Julian Forbes, almost twenty years her junior, a man who was envious of his wife's success but unable to achieve his own. He was a hard drinker and when drunk always tried to seduce one or more of Celia's friends. Again without success. When Celia is found dead, it appears to be suicide. There is open medication on her nightstand, tranquilizers and sleeping pills. The Marshal, however, believes Celia has been murdered and her husband is somehow involved. The proof, however, is not evident as there isn't a mark of violence on Celia. Still, the Marshal believes her death was not accidental or a suicide, but with no evidence to support his belief, how will he prove it? The mysteries in this series are so elegantly constructed, with richly drawn characters and vivid descriptions of place. The Marshal is a devoted family man, and in the present book his weight is of concern to his wife. She has put him on a strict diet, though this doesn't interfere—at least, not much—with his deductive investigation of what he believes to be a murder. The Marshal at the Villa Torrini is a pleasure to read, both for its mystery plot and to learn more about the Marshal, a most interesting character that continues to evolve with each succeeding book. Special thanks to guest reviewer Betty of The Betz Review for contributing her review of The Marshal at the Villa Torrini. Acknowledgment: Soho Crime provided a copy of The Marshal at the Villa Torrini for this review.